It simply ain’t just: Do horses recognise unfair situations? All horse owners have been there, facing the conundrum of how to provide extra feed to those who need it while the “good doers” have to get by on lesser rations. You can see the disappointment on the faces of the horses who miss out, right? 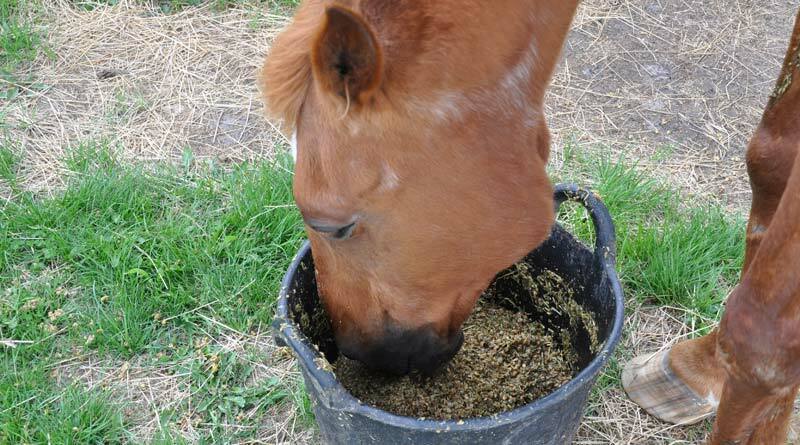 Owners come up with a variety of solutions, such as separating the affected horses or offering the good doers a morsel in a feed dish in the hope they won’t realise their companions are getting a full ration. Scientists refer to the response to cases of perceived unfairness as inequity aversion. Recognising inequity is an important social skill in humans. Different species of primates show this sensitivity to inequity, too. However, there has been limited investigation of the subject in other species. It has been seen in dogs, in situations where the dogs themselves did not get food but their partners did for the same action. So far, this skill in dogs has been attributed to their adaption to humans – domestication. Now, comparative psychologists in the Messerli Research Institute at the University of Veterinary Medicine in Vienna have found that not only dogs but also wolves react to inequity. They found that wolves and dogs refused to cooperate in an experiment when only the partner got a treat or they themselves received a lower quality reward. This behaviour, they found, was equally strong in wolves and dogs, suggesting it was unlikely to be an effect of domestication but rather inherited from a common ancestor. The findings of Jennifer Essler, Friederike Range, and Sarah Marshall-Pescini have been reported in the journal Current Biology. “In the no-reward test, only the partner got a treat in every trial,” Essler explained. “The test animal got nothing. In the quality test, both animals got a reward, but the preferred and thus higher quality treat was again given to the partner. Hierarchy was also important, they found, and they also noted that domestication seemed to reduce the sense of inequity to some degree. So, has inequity aversion been seen in horses? A poster presentation on the subject was given in 2015 at the 34th International Ethological Conference in Australia. University of Tokyo researcher Ayaka Takimoto and her colleagues set out to determine whether domestic horses were sensitive to unfair situations and whether they reacted to inequity negatively. In their experiment, both a partner and a subject horse were trained to touch a target when given a visual and verbal command to do so. In the unfair phase of their experiment, a piece of carrot (considered a high-value food reward) was given to the partner by the experimenter for successfully completing the task whereas the subject horse received only a single pellet (considered a low-value food reward) for his successful efforts. The subject’s reaction times were significantly longer in the unfair condition than in the fair and control conditions, they reported. Horses also performed more indirect approaches to the target in the unfair condition compared to the fair and control conditions. “These results suggest that horses were slower to perform the task and adopted a more indirect strategy when unfairly rewarded compared to the fair and control conditions,” according to a summary. This, they said, was the first experimental evidence of inequity aversion in ungulates. She noted that previous observational research in animals had shown hints that animals did respond to inequity. Chimpanzees, for example, responded with temper tantrums if they did not get what they desired, social dogs refused to play with individuals who violated social rules, and ravens showed third-party intervention against norm violations. She wrote: “Most people who have spent significant periods of time with animals seem to assume that animals respond to being treated inequitably. “I have had horse trainers tell me that horses who see another individual receive a superior reward will fail to work for a lesser reward (even if the task has been established as eliciting a lower reward). Dog owners note that their pets react if one gets a treat and the other does not. “However, all of this is anecdotal evidence and lacks the rigor of carefully conducted experimental research,” she wrote at the time. Ayaka Takimoto, Leanne Proops, Atsuko Saito, Toshikazu Hasegawa. A summary of the poster presentation can be read here.